I do all my gaming almost exclusively on console. Nothing relaxes me more than sitting in my game room, surrounded by my tech and allowing my brain to shut off for a few hours while playing either a small indie game or the latest AAA blockbuster. I also travel a lot for work, yanking me away from my chillzone for days at the time. Sitting in lonely hotel rooms, I often feel like I’m missing out on my games, even though I have a billion dollars worth of games right in my pocket and I’ve maybe played maybe $9 worth of them. No more! Time to give these games a fair shake. Sausage Bomber is a physics based mayhem game where the primary weapon is sausage. To complete the 96 missions the player will have to use “precision daylight sausage bombing” to blow up the military equipment of the enemies of Fredonia. These consist of tanks, helicopters, Anti-Air and other stuff that goes BOOM when touched by a Kielbasa. Just fly over the battlefield and drop them sausages and watch everything explode. Yes, it’s just as silly as it sounds but it’s ridiculously charming at the same time. I played this game for a couple of hours while stuck at an airport and the silliness kept me entertained throughout. 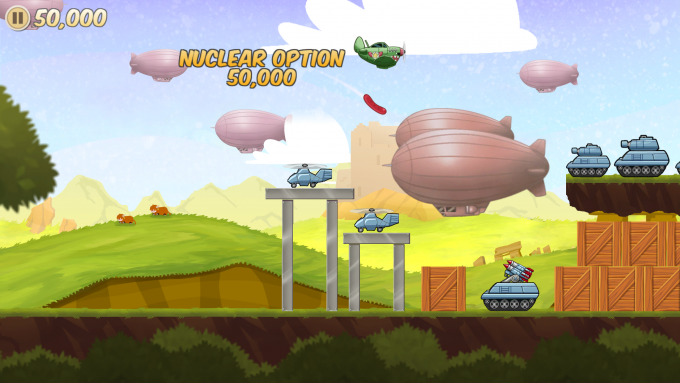 It’s hard not to make an “Angry Birds” comparison as it is still about throwing projectiles at stuff to knock things over and clear a field, but the mechanics are different enough not to judge the game as a clone. In my head canon, it’s a successor to the popular franchise where both the birds and the pigs have upgraded their military prowess. Except the birds now bomb the pigs with the processed carcasses of their ancestors. Man, those birds are brutal. Cleaning the battlefield creatively will yield higher points and these are raked in by dropping the sausage bombs strategically in order to create chain reactions. Tossing tanks into other tanks, making them flip several times or giving them extended airtime will add additional points as well. Also, the less sausages used during the run, the more points are earned. At the end of the run, these points are reflected in the amount of medals earned. More medals means more “war-efforts,” which can be used to purchase Atomic Sausages and new planes. While the Atomic Sausage is like a “Super” that helps clear a difficult level, the new planes are cosmetic upgrades. It has to be mentioned that all the upgrades are purchased with in-game credits. There doesn’t appear to be a “buy points” option either, making this a safe game for kids to play without accidentally wreaking havoc on the family credit card. However, there is the option to watch a 20 second video ad to double the points earned, which could potentially lead the little devils to the app store. After binge playing the game for a few hours during a trip, I still find myself pulling out Sausage Bomber occasionally, and for $1.99 it’s very low risk. It’s a fun little game with a surprising amount of content for the price. I also got to make a lot of dumb sausage jokes and that, is priceless. This review is based on a copy of the game purchased by the reviewer.